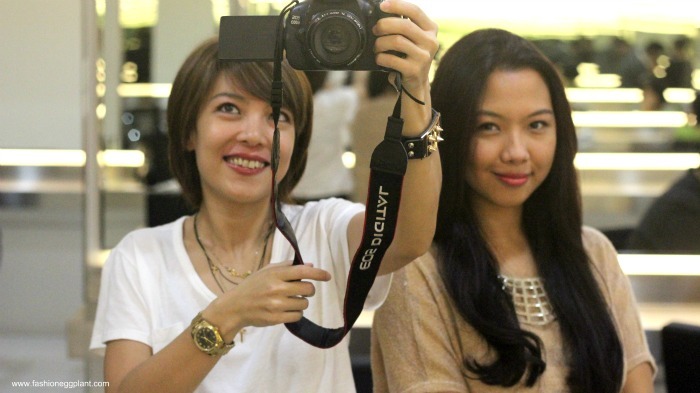 As a blogger, I am (thankfully) often presented the opportunity to try out different salons but few have impressed me the same way Maldita Studio has. Fairly new in the game, I think they just opened last February, Maldita has all that it needs to take them straight to the top. 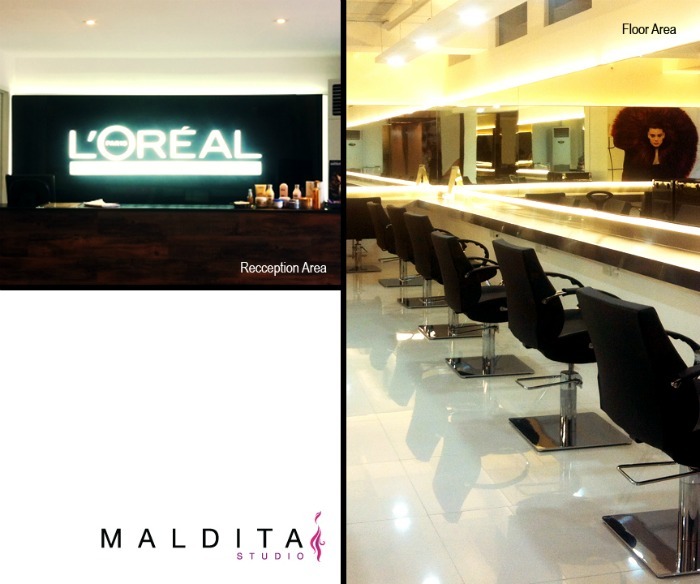 Maldita Studio is pegged as a mid-priced salon but it certainly doesn't feel that way once you're inside. It is spacious, clean and tastefully designed. Okay, so I guess I've established how nice the place is but when it comes to salons, what's really important is the skill level and service of the people working there. I have really unruly hair. It's thick and coarse. Most hairdressers have a problem dealing with it and I have a problem with that of course because it makes life a lot more difficult for me. Hair to me is such a big deal. It really affects my over-all well being. I've been stuck with bad haircut after bad haircut for the past few months which made me really feel not at all like myself. That is why, as you have probably noticed in my recent ootds, that I have resulted to wearing hats a lot or tying it in an awkward ponytail. It was really awful and the fact that I paid quite a hefty amount for those two haircuts didn't help at all. Entering Maldita Studio, my expectations weren't really that high. I came in with the belief that the best haircuts come along with a substantial price tag. Boy, was I wrong. During my visit, I was attended to by Mr. Carl and he is all sorts of amazing. I love the fact that he was honest. I had a couple of suggestions which he did not agree with and did not hesitate to tell me so. You gotta love that because sometimes, that's what we really need to hear. They're the experts after all and they should know what's best for my hair. So I let him do what he thought best and I could not be happier with the results. I finally have decent, even great hair and it's done wonders for my self esteem in such a short span of time. And to think it cost less than half of my previous cuts in other supposedly great salons that all ended in disaster. So the lesson I learned here is that price+haircut doesn't always equate to a good hairstyle. Maldita Studio is very reasonably priced and yet their services are just as good, if not better, than most high end salons I've tried. I am really, really in love with Maldita Studio, sorry but I am just so thankful for what Mr Carl managed to do with the mess of a cut I walked in with. So thank you, thank you, thank you. From this day on, I will no longer let anyone else touch my hair. Maldita Studio is definitely a diamond in the rough and I'm so happy I discovered it. Aside from great haircuts and color, they also offer threading, waxing, manipeds, footspa, and other regular salon treatments. I tried their footspa, threading and maniped service and I was just as equally pleased. Everything's to love at Maldita Studio, honestly. Guys, galing sobra, promise. And you know what, the real test of a good haircut isn't having great hair when you leave the salon. You will know a great haircut after 3 days, once you've washed it several times. Mine is still beyond great and I even prefer it without styling and a blowdry. Just some leave-in conditioner after I get out of the shower. True amazing wash and wear hair. Love, love, love talaga. Maldita Studio is open daily from 9am-7pm and is located at the ground floor of Rosemont Tower, Panay Avenue, Quezon City. All major credit cards, reservations and walk-ins are welcome. For inquiries, you may contact these numbers: +6327366943 and +639228860466. I agree! I love, love how your hair looks so chic! and it's wash and wear - one of the basic musts when I get haircuts! haha! you look really great, Sarah! :D aprub!